Tube contract Wabtec subsidiary Brush Traction of Loughborough has won a contract worth up to £6.5 million from Transport for London to refurbish the motors on the Piccadilly Line fleet, which is to continue for at least another five years until it can be replaced by new trains in the 2020s as part of the New Tube for London programme. Wagons deal VTG Rail UK has signed an agreement with Mendip Rail Limited for the hire of 130 new aggregate wagons. Theywill be a mixture of hoppers and boxes, and used to move stone from the Aggregate Industries and Hanson ‘super quarries’ in Somerset to various destinations, many in London and the south east. Delivery is due to start next summer. 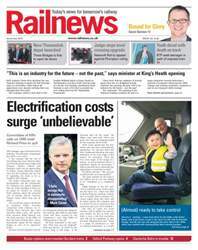 The tempestous Network Rail evidence session held by the House of Commons Public Accounts Committee in late October makes the lead in the new edition of Railnews. The Committee has been deeply critical of Network Rail's management of its projects with particular attention being paid to the Great Western Main Line, where costs have trebled and the work itself is behind schedule. Another problem, but perhaps a happier one, is the overcrowding on the recently reopened Borders Railway. This reached such a point during the October mid-term school holidays in Scotland that replacement buses had to be used, and we also reveal that the large car park at the Tweedbank terminus already needs an 'overflow' area. There have been several openings in October, including the new station at Oxford Parkway and the Thameslink depot at Three Bridges, as well as the modernised Manchester Victoria. The National Training Academy for Rail in Northampton was also declared formally open by rail minister Claire Perry, who made an impassioned plea during her speech for the railway to look forward, saying: “This is an industry for the future – not the past”. British Transport Police are seeking a youth who crossed the tracks at a station only moments before a fast train ran through, while a bid to replace the Victorian crossing gates at Plumpton in Sussex has hit a snag -- a judge has granted the local council an injunction against Network Rail carrying out the work on planning grounds. In other news, trams should be running on the first part of Manchester's Second City Crossing before Christmas, Virgin Trains and Stagecoach Group have rebranded the Flying Scotsman and also issued a joint call for franchises to be replaced by licensed operators on intercity routes, while National Express has signed two more operating contracts in Germany. Can we really devolve rail? Is the £44m transformation of Manchester Victoria incomplete?